Driving in Hoboken is prohibited and Hoboken Public Safety is using the only entry point working via the 14th Street Viaduct. Most phone lines are down, so we are activating several new cell phones and will be announcing new phone numbers for the Emergency Operations Center shortly. The flood pump is operational and flooding continues, but is receding in areas. PSE&G is working on 14th Street. We will provide more information on power as we can. We can't provide details on specific addresses, but we encourage residents to share information with each other. MSV will post the updated information when available. Many fire alarms have been triggered due to flood waters. We are trying to reach them as soon as possible, but many areas are inaccessible. If you can access your fire panel AND there is no water, you can silence most alarms. Open the panel and press the "silence" button. The police are asking people on the streets to return to their homes. City curfew remains in effect until 6:00 PM. Hoboken Public Safety is working its hardest and PSE&G has trucks operating in town but there's going to be lots of issues cropping up in addition to the existing issues. 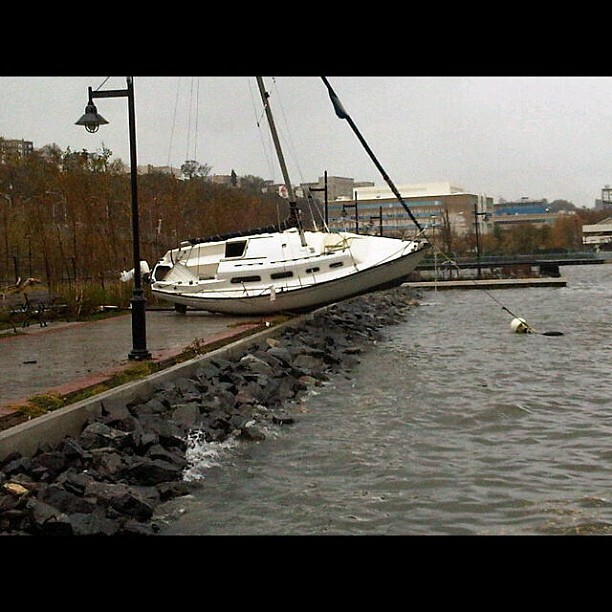 Here's one taken by NBC's Natalie Morales via Hoboken Girl.